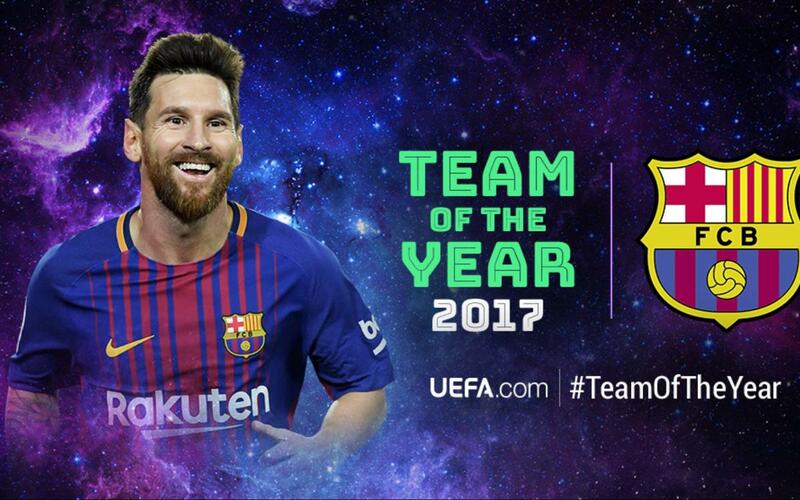 Leo Messi named to UEFA.com Team of the Year! FC Barcelona striker Leo Messi was named to the UEFA.com Team of the Year for 2017, football's governing body in Europe announced on Thursday. It is the ninth time Messi has received the prestigious distinction throughout his illustrious career. The 30-year-old Argentinian virtuoso — who is widely regarded as the greatest player of all time — was previously named to UEFA's Team of the Year in 2008, 2009, 2010, 2011, 2012, 2014, 2015, and 2016. Messi was one of four Barça players nominated — the others were defender Gerard Piqué, midfielder Andrés Iniesta, andstriker Luis Suárez — when UEFA unveiled a list of 50 finalists on November 22, 2017. The UEFA Team of the Year was determined through online fan voting on UEFA.com. For the 2017 Team, a total of 798,149 users cast a total of 8,779,639 votes. Forty-six percent of the votes were cast by users based in Europe, followed by 25% from Asia, 10% from South America, and 9% each from North America and Africa. One percent of the votes were cast from Oceania. The country with the highest participation was India, where almost one-tenth of votes were cast. The leading age bracket worldwide was that of 18–24 year olds, who cast 44% of the votes.